The dangerous world of technology has made it almost impossible for persons with EMS to be able to survive, since electromagnetic radiations are everywhere, worldwide, in the form of computers, cell phone towers, cell phones, portable phones, power lines, televisions, recorders, remote controls, telephones, car electronics, radios. pagers, audio and video recorders, digital cameras, airports, aircrafts, marine radars and radio transmitters, irons, refrigerators, washing machines, electric clocks and watches, VDU and countless other electronics. “Radiation from cell phones is far from being as harmless as we have been told by cell phones companies. Therefore, in order to act responsibly, the Chamber of Doctors, in Vienna, Austria, has decided to inform people about potential medical risks”. Mobile phone towers installed by cell phone companies almost at every place, pose a serious threat to human health as these towers emit deadly electro magnetic radiations, which directly affects human brain. DUE TO Information Technology (IT) and new electronic devices, distances are reducing day-by-day but these things are affecting the health of human beings. The ‘transmission towers’ pose a serious threat to human health. The EMR not only causes death, damage DNA, tumors and skin cancer but is also very dangerous for pregnant women and their unborn babies. Radio-frequency radiations have started showing its ill-affects on humans, animals, medical investigatory equipments and also on food products. It produces EMR pollution, which is also called RF Radiation Pollution. Because of mobile communication, television transmission, FM radio towers have increased in numbers, which in turn is increasing EMR pollution. 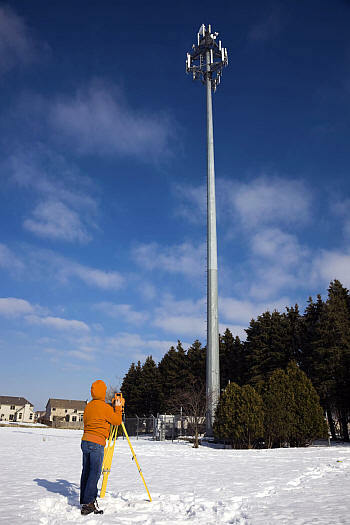 To satisfy the requirement of consumers, cell phone companies are installing tower almost at every place in small towns, villages and in rural areas also. Along with communication services, cell phone companies also provide facilities like GPRS, GSM, CDMA services for Internet users, which gives maximum radio frequencies to users 24 x 7 and that is leading to a dangerous impact on human health and behaviour. It is also affecting the stamina and thinking power of humans as these radiations directly attack the brain. 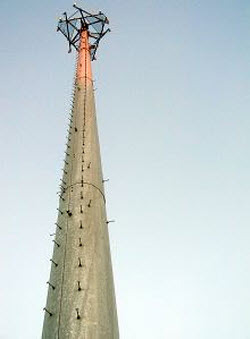 The telecom companies continue to install towers, which have a radiation power level of 7260 microwatt/m2, despite the specified level being just 600 microwatt/m2, which is a great matter of concern. This standard fixed by the International Commission of Non-Iodised Radiation is not being followed by mobile phone operators. Mobile phone towers emit electro-magnetic rays with a frequency of 1900 MHZ. With this high frequency, they can easily pass through our bodies. 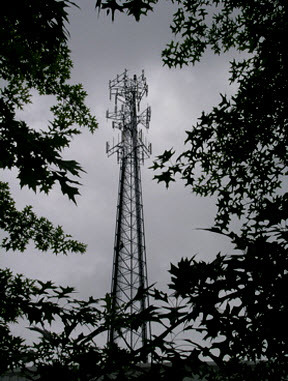 Mobile phone towers’ radioactivity can, thus, affect every living thing within a square kilometre range. EMR can cause memory loss, headache, allergy and skin diseases. 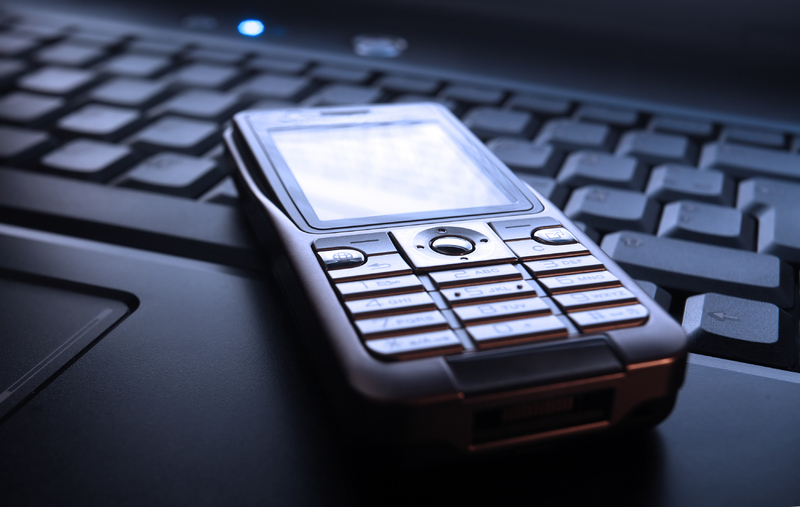 Sperm-count in men is known to reduce with daily use of cell phones. The growth of mobile telephones in India is very rapid. Today, in India, there are almost 35crore mobile users and the number is increasing rapidly. 300 per cent cases of cancer are reported from people who have been living within a distance upto 400 km from mobile towers for decades compared to those who live far away from these towers. Breast cancer tops the list. Even birds avoid these towers. Towers are like deadly weapons for all living beings. 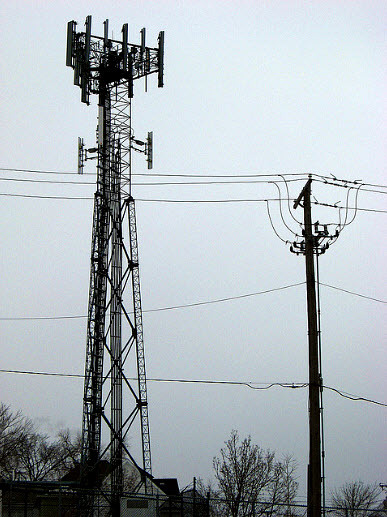 There is a lot of paranoia surrounding cell towers s and possibly human health risks. What is important to understand is that radio frequency field intensity is related to the inverse of the distance squared. The exposure that you get from being in the vicinity of a cell tower is hundreds of times lower than the exposure you get using a cell phone. The only exception to this might be in a situation were cell phone antennas are operated on top of a roof and people are allowed access to that roof top so you can get right up close to the antennas. This isn’t to discredit earlier studies however. The earliest cellular handsets operated at power levels up to four watts. Without any external input your brain normally produces about 12-25 watts of heat. An additional 4 watts is a significant heat load and it’s not heat that is distributed evenly but rather concentrated near the antenna. So it is extremely likely that there were significant health risks with these phones. The next generation cut that power to 1 watt maximum. Still enough for mild thermal effects and possibly some marginally increased risks. 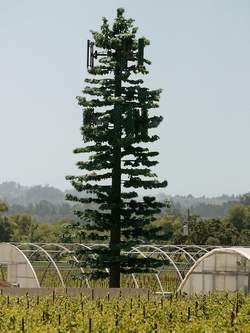 Also, once a cell tower is erected, it has proved very difficult to verify the radiation is within legal limits. There are no safety measures in place to ensure that the towers are not emitting higher radiation levels than legally allowed. One frustrated resident finally spent $7,000 purchasing his own equipment to test a cell phone tower near his home, and found it emitting radiation at levels 250% over the legal limit. Scientists and advocacy groups say that the current FCC “safe” standards are based on 1985 research, and fail to consider more recent research that found brain cancer, memory impairment, DNA breakdown, and neurological problems with RF at much lower levels. The earlier studies considered only the “thermal”, or heating effects of the radiation – in other words, the level at which the radiation would heat tissue, or “cook” a person, in the same exact manner that a microwave oven works. The FCC levels may ensure our tissues are not “cooked”, but they fail to address long-term chronic exposure at low levels, or what is called “non-thermal” effects. 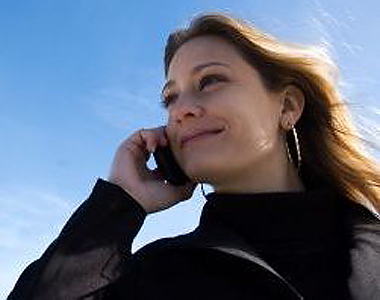 Doctors say that RF radiation is wreaking havoc with normal biological cell functions. “RF alters tissue physiology”says Dr. George Carlo, an epidemiologist who found genetic damage in a $28 million research program, paid for by the industry. He now fights to have safety levels lowered. The world’s leading electromagnetic researchers say existing scientific knowledge is inadequate to set reliable exposure standards. – The Vienna Resolution, 1998. The Salzburg Resolution, adopted in 2000 at the International Conference on Cell Tower Siting, would prohibit any cell site from emanating more than .1 mW/cm2 – 10,000 times more strict than the current U.S. standard. This limit takes into account the growing evidence for non-thermal RF bioeffects. Cell phone towers expose the public to involuntary, chronic, cumulative Radio Frequency Radiation. Low levels of RFR have been shown to be associated with changes in cell proliferation and DNA damage. Some scientific studies show adverse health effects reported in the .01 to 100 mW/cm2 range at levels hundreds, indeed, thousands, of times lower than the U.S. standards.These harmful low levels of radiation can reach as far as a mile away from the cell tower location. Reported health problems include headache, sleep disorders, memory impairment, nosebleeds, an increase in seizures, blood brain barrier leakage problems, increased heart rates, lower sperm counts, and impaired nervous systems. Children are at the greatest risk, due to their thinner skulls, and rapid rate of growth. Also at greater risk are the elderly, the frail, and pregnant women. 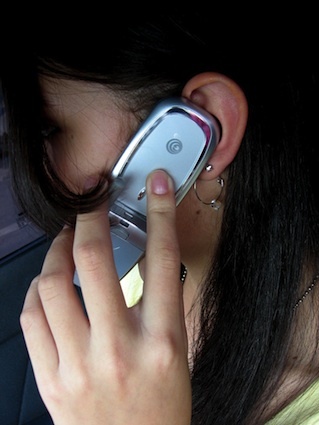 Doctors from the United Kingdom have issued warnings urging children under 16 not to use cell phones, to reduce their exposure to radio frequency (RF) radiation. Over 100 physicians and scientists at Harvard and Boston University Schools of Public Health have called cellular towers a radiation hazard. And, 33 delegate physicians from 7 countries have declared cell phone towers a “public health emergency”. The U.S. Federal Communications Commission (FCC) is in charge of setting the standards of exposure for the public, and claims that, based on scientific studies, the current levels are safe. But it is not a public health agency, and has been criticized as being “an arm of the industry”. Many who work for the FCC are either past, present or future employees of the very industries they are supposed to regulate. With an explosively emergent $40 billion dollar a year industry at stake, critics have stated “you can bet that their studies are going to show whatever they want them to show”. Radiation. Powerful enough to turn Dr. Bruce Banner (Bill Bixby) into The Incredible Hulk (Lou Ferrigno), or meek Peter Parker (Tobey Maguire) into The Amazing Spider-Man (still Tobey Maguire, but more buff and spandexed). It also obliterated two cities in Japan, and continues to contribute to cancers near Chernobyl. It’s sciency, strong, and scary. No wonder it creates so much apprehension. Not all radiation is the same. The more-powerful, cell-damaging kind is called “ionizing radiation,” and we know that can strip atoms apart and disrupt DNA. This kind of radiation occurs in cosmic rays and diagnostic x-rays, and that’s why radiology technicians wear lead overcoats. It is a bad idea to be exposed to excessive ionizing radiation, though even that risk should be put in perspective, since you can’t possibly avoid it entirely. For comparison, a single chest x-ray exposes an adult to about the same ionizing radiation that you’d get in three days of living on the earth at sea level. Three days, that doesn’t sound so bad. But an abdominal CT scan? That’s about three extra years. Diagnostic radiology is a wonderful tool, but it should be used carefully. The other kind of radiation is called “non-ionizing.” You’re swimming in that, too. All light is a form of non-ionizing radiation, as are radio waves and microwaves. Though at very intense, high exposures these kinds of radiation can damage tissue (think about a microwave oven, or spending a day in the sun), the process of damage is by the transfer of heat, not the destruction of DNA or other molecules directly. And it only takes a very thin layer of shielding to protect from even intense non-ionizing radiation. You can get a sunburn, yes, but you won’t burn through a thin piece of clothing or a layer of sunscreen, and a little piece of darkened plastic can make squinting unnecessary even on a bright day. Non-ionizing radiation doesn’t penetrate tissue well, and that’s one reason it’s thought of as generally safe. I realize that current permitted development rights and the fact that we must move with the times, means that these masts must be sited somewhere. All I would ask is that due consideration is given to the future health and well-being of ourselves and the generations to come, and that as a result, some compromise can be found, whereby these masts can be situated a minimum of one kilometre from any residential, school or public area. Surely it would be feasible, in many cases, to ensure that the siting of these masts and, therefore, their emissions, impinge as little as is possible on the surrounding environment, residential and public areas in particular. The personal use of mobile phones themselves can then be a matter for each individuals conscience, without the added risks of a permanent structure which would otherwise deny us that freedom of choice and, therefore, deny us our divine right to enjoy and maintain good health. This would also obviate the need for litigation cases in the future. However, it is very apparent that when we are subjected to man-made unnatural and chaotic frequencies, such as microwaves, then our body can and does store this unbalanced information in its energy fields which can lead to a weakening of our defence mechanism and ultimately illness and disease as our cells begin to reproduce in the likeness of the unbalanced information it has taken on board. This is a result of the body expending too much energy – more than it is capable of producing – whilst attempting to restore balance to energy fields that have been compromised by EMF pollution, ultimately leading to a breakdown in homeostasis.